During a quick trip to Arizona, husband and I visited the south rim of the Grand Canyon, then swung north to Page, Ariz. to photograph Antelope Canyon. I coined the trip “Our Rock Vacation” because when I came home, that’s all I had pictures of – beautiful vistas, soaring mesas and curvaceous rock formations. 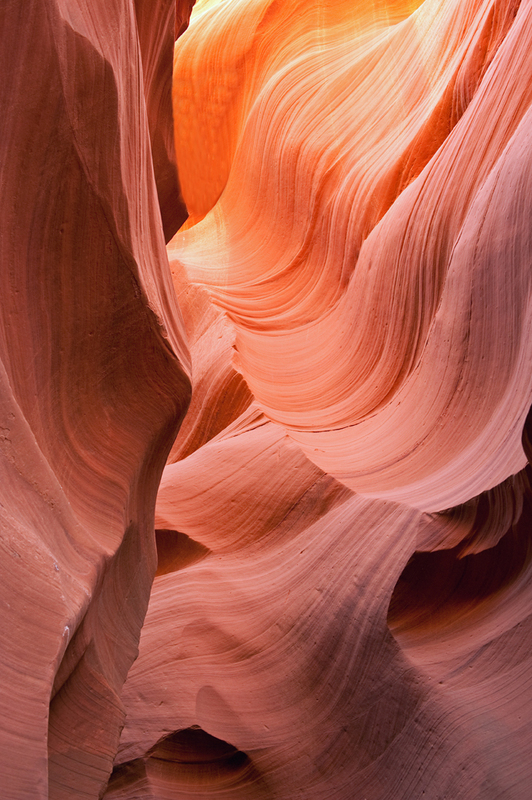 For those interested in photography, here are a few tips about Antelope Canyon. 1. We read that Upper Antelope Canyon was more touristy and required a guided tour. While some believe the Upper Canyon is more beautiful, we opted for Lower Antelope Canyon to stay away from the crowds. 2. In Lower Antelope Canyon, if you show your SLR camera on a tripod, you are given a photographer’s pass for two hours that allows you to tour the slot canyon on your own. 3. SAND. The winds were 20-30 MPH when we were at the canyon, and sand was swirling in every direction. Make sure your memory cards and batteries are installed before you get inside the canyon. 4. In the upper part of the canyon, we were told light is best between 11:00 a.m.-1:00 p.m. For the lower part of the canyon, light is better after 1:00 p.m. We were at the canyon between 12:30-2:30 p.m., and the light conditions weren’t bad at all. The entrance into the canyon is very narrow. Photo bags need a shove to make it through the slot, and sucking in your stomach might be required for some! I was without a tripod and just had a small day bag. While my pictures might have been clearer if my camera was mounted on a tripod, I was glad I didn’t have too much equipment on me. 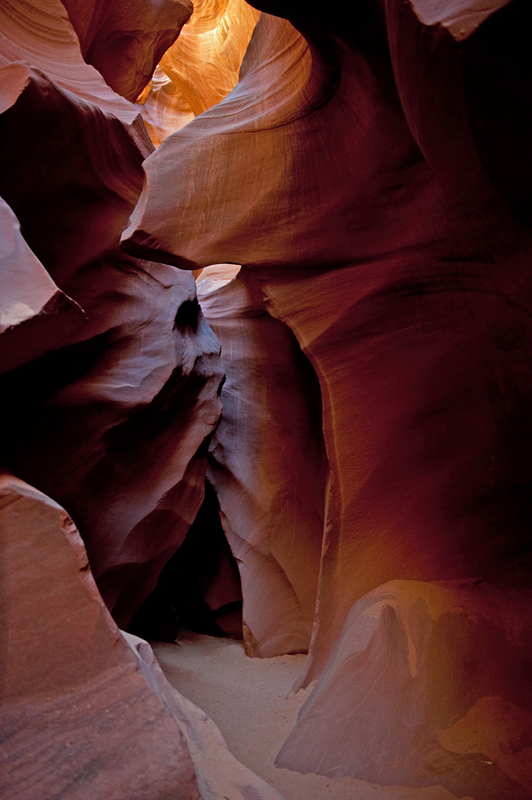 Antelope Canyon is part of the Navajo Nation’s Parks and Recreation Service. Lower Canyon is located on Highway 98 outside of Page, Ariz. Driving from Page, the turn-off to Lower Canyon is on your left, and is not well marked like the Upper Canyon entrance. If you pass the power plant, you’ve gone too far. This entry was posted in Photography, Travel and tagged Antelope Canyon, Arizona. Bookmark the permalink. I was there last year. It is a pretty amazing place. I didn’t have a tripod with me and the widest lens I had for my Canon 40D was 28mm. As you can imagine, it wasn’t quite wide enough for a lot of the great photo opps. Also, not having a tripod didn’t help as it is dark in places. Even so, I got some great shots. Unfortunately, it was kind of overcast when I was there so none of those brilliant rays of light. Sounds like you made the best of your trip! Such a spell-binding place. I’m glad you walked away with some photos despite the conditions.